UPDATE: Rumor has it, this store is CLOSED. 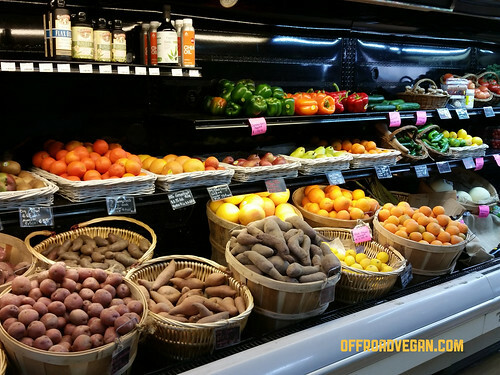 When it comes to vegan grocery stores, Food Fight in Portland is considered my own personal “high water mark.” They just don’t get any better than that. So I was really stunned to find a vegan grocery store in California that blew Food Fight out of the proverbial coconut water. 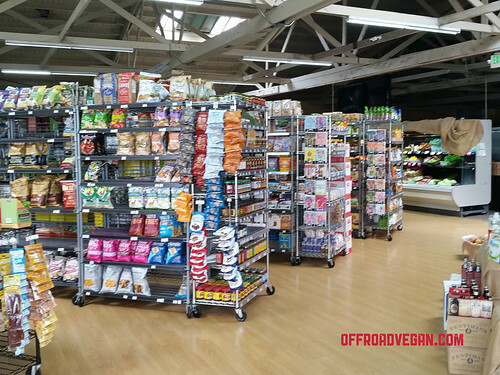 Viva La Vegan is a huge grocery store in an old railroad building nestled among the community of Rancho Cucamonga. With a ton of open space and great lighting, the store is bright and airy, and very well laid out. The produce section, while small, was clean and had some really nice fruits and veggies. 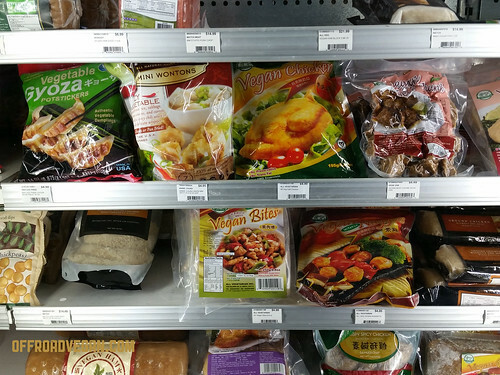 The frozen food was really impressive, with a lot of the asian vegan analogs, with some even available in bulk (they also had bulk Daiya cheeses and bulk Beyond Meat). The usual contenders also had a significant presence – Daiya and their pizzas, Beyond Meat (which is a local company for Viva La Vegan) and Gardein had an entire freezer, with products I haven’t even seen before. Some of the many vegan frozen items. 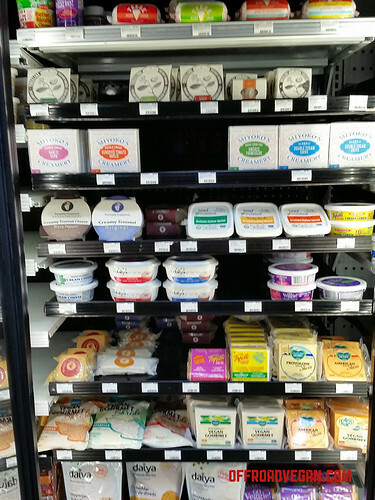 Also in the refrigerated section, it was nice to see some self-branded grab and go items such as Jackfruit Carnitas, Mac and Cheese, and some others with the Viva La Vegan label on them. The cheese section was IN-SANE with products from Miyoko’s Creamery, Treeline, Daiya, Teese, and others. One of the most impressive sections of the store, however was not even for the human vegan, it went to the dogs. With a huge array of V Dog and other dog stuff, it was by far one of the most impressive vegan dog aisles ever. 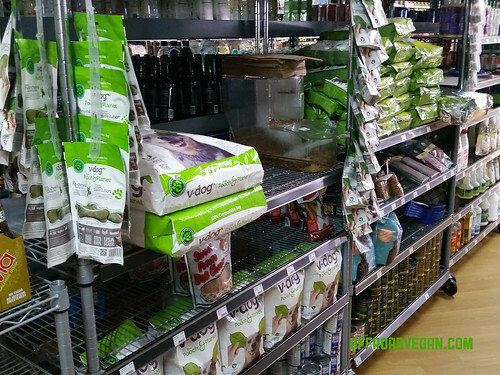 Gone to the dogs: an impressive vegan pet aisle! Last was the very significant supplement selection. 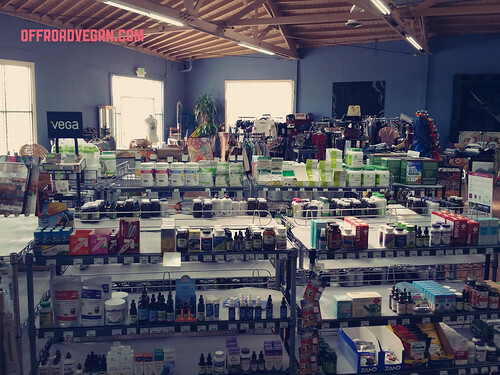 Viva La Vegan has everything from essential oils, to Vega sport protein, and all the standard pills and vitamins. They also featured lotions, and vegan cosmetics. Groceries are great and all, but what I really wanted to try was their deli, which is a work in progress at the time of this writing. What offerings they did have, were burritos, tacos, or bowls. I ordered a “beef” burrito with black beans, nacho cheese, rice, and sour cream. The beef was actually really good, more of a beef chunk than a beef crumble. I forget the brand of beef they used but I was not familiar with it. The burrito was huge and made an awesome lunch. They also have a small case with fresh vegan donuts. Last, there was a great section in the back of the building with vegan shoes (some of the men’s dress shoes were from Portugal), clothing, consignment and even wall art. A lot of the stuff was really nice. 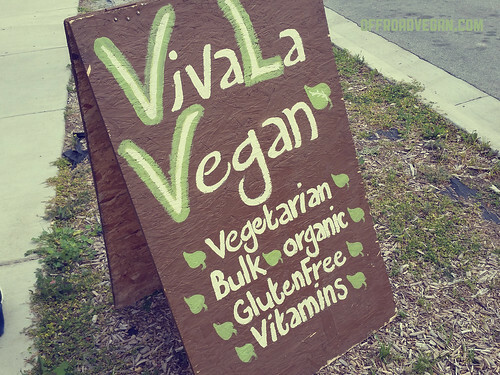 I’ll be honest…in closing, I think the location for Viva La Vegan is weird. I would never in a million years expect a store of this magnitude in a place like Rancho Cucamonga (there is another location in Santa Monica). But good for them and good for the people around that continue to support this awesome vegan business! Previous PostProduct Install: Bully Dog GT Platinum TunerNext PostShould You Buy an Extended Warranty for your Jeep?